Age-related Macular Degeneration (AMD), a neurodegenerative disease of the retina in which retinal pigment epithelial (RPE) cells degenerate, represents the major cause of blindness in the elderly population of industrialized countries. AMD has no effective treatment except for a limited group of patients who suffer from the exudative form of AMD, which is characterized by the invasion of Bruch's membrane and subretinal space by choroidal blood vessels forming a neovascular membrane (CNV) and by degeneration of RPE cells. Exudative AMD is the result of an imbalance between factors promoting vascularization (i.e. vascular endothelial growth factors, VEGF) and factors inhibiting vascularization (i.e. pigment epithelium-derived factor, PEDF). PEDF produced by RPE cells is critical for maintaining the subretinal space avascular, and it has been shown to inhibit CNV in animal models. Thus, the symptoms of AMD could potentially be alleviated by exogenous administration of PEDF; however, its short half-life of 6 hours limits its usefulness when delivered by intraocular injection. Surgical removal of the CNV and subsequent transplantation of autologous iris pigment epithelial cells (IPE) or autologous RPE cells, which produce PEDF, did not improve vision indicating that the transplanted cells do not produce PEDF in sufficient amount to inhibit VEGF. The only effective treatment for exudative AMD is the frequent, often monthly intravitreal injections of a monoclonal antibody against VEGF (Lucentis® or Avastin®) resulting in vision improvement in 30-40% of patients. Since there are no tests to indicate which patients benefit monthly intravitreal injections of anti-VEGF for 2-3 months are necessary to determine whether a patient will respond. However, frequent intravitreal injections are associated with severe adverse events, e.g. retinal tears and detachment, ocular hypertension and endophthalmitis. Due to the large number of intraocular injections (over 2 million in the USA in 2009) there are significant numbers of patients with adverse events. In addition, the substantial costs associated with frequent anti-VEGF injections represent a significant economic burden on patient care in Europe, thereby justifying the need for alternative medical interventions and solutions. The goal of the proposal, TargetAMD, is to replace degenerated RPE cells with pigment cells that have been genetically modified to produce continuously for the life of the patient PEDF, the anti-VEGF and neuroprotective factor that in healthy eyes is produced by RPE cells. To insure that the transplanted cells produce PEDF for the life of the patient, we propose to transfect RPE cells and IPE cells with the PEDF gene. The PEDF gene will be delivered to the pigment cell genome using the hyperactive variant of the Sleeping Beauty (SB100X) transposon. SB100X is a non-viral, integrating gene delivery system based on transposable elements or transposons that can integrate in the genome via a cut-and-paste mechanism called transposition. The advantage of SB transposon-based gene delivery is that it combines the favorable features of viral vectors with those of naked DNA molecules, without the limitations of virally-based vectors, e.g. transient transgene expression for adenoviral vectors, immune response, possible dissemination in tissues far from the cell of interest, and tendency to be mutagenic for retroviral and HIV-based vectors. Due to permanent genomic insertion of transgene constructs into the host cells, transposition-mediated gene delivery leads to sustained and efficient transgene expression. Transposon-based, non-viral integrating vector systems, in particular the Sleeping Beauty (SB) transposon represent a novel technology that combines the efficiency of viral vectors with the simplicity and safety of naked DNA molecules leading to sustained and efficient transgene expression. Based on studies from our laboratory that have shown that RPE and IPE cells transfected with the PEDF gene using the SB100X transposon are not genetically compromised, produce PEDF continuously and inhibit neovascularization when transplanted in animal models of corneal and retinal neovascularization, we propose to perform two Phase Ib/IIA clinical trials. In one trial PEDF-transfected, autologous RPE cells and in another PEDF-transfected IPE cells will be transplanted to the subretinal space of exudative AMD patients. Since autologous IPE cells can be obtained with a simple biopsy, whereas autologous RPE cells require a complex surgical intervention, IPE cells would be preferable if they can substitute for RPE cells, as many studies have suggested. 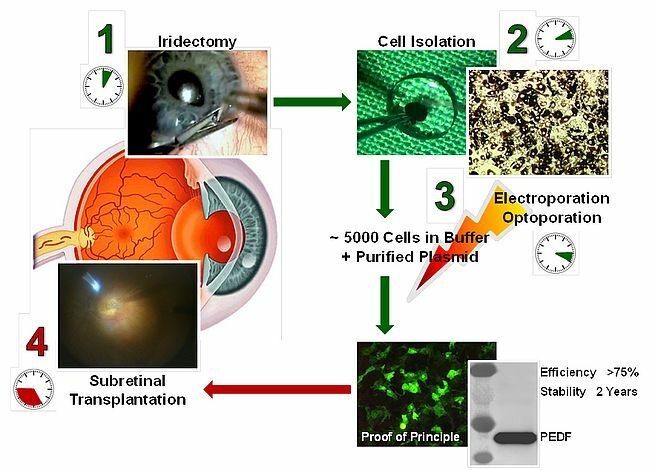 The protocol proposed for the treatment of exudative AMD will consist of isolation of autologous pigment epithelial cells by surgically established procedures, transfection of the isolated cells with the PEDF gene using the SB100X transposon system and implantation of the transfected cells subretinally into the same patient by surgically established procedures. All steps of the protocol will be carried out in the operating room within a 45-60 minutes surgical session by experienced retinal surgeons. These two clinical trials will also establish a clinical standard for future clinical trials using non-viral, transposon-based vectors. The figure shows the steps required for the clinical trial with iris pigment epithelial cells. Step 1, in the surgical suite an iridectomy is performed on the patient. For the trial with autologous RPE cells, RPE cells are isolated from the peripheral retina of the patients; all the following steps will be the same. Step 2, the cells are isolated from the tissue. Step 3, the cells are transfected with the SB100X transposon plasmid carrying the PEDF gene using electroporation. Step 4, the cells are transplanted subretinally in the patient. The entire procedure including iredectomy (or peripheral retina biopsy), cell isolation, transfection and cell transplantation will be done in less than 1 hour.